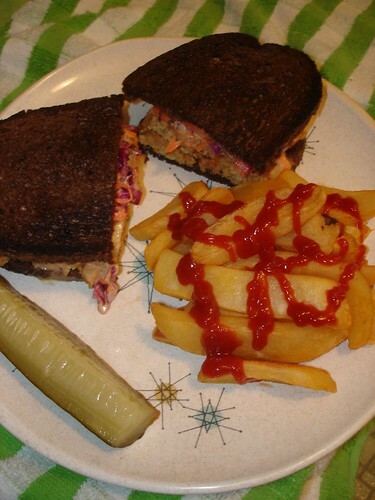 Posted byMandy	 July 31, 2008 May 16, 2011 2 Comments on Tempeh Reubens! I love tempeh Reuben sandwiches. This is my take on a traditional Reuben, complete with homemade Russian dressing and spicy coleslaw replacing sauerkraut. I find that marinated tempeh gives the sandwich more flavor. I marinated triangles of tempeh in my special marinade for a few hours. I also use this marinade for portobello mushrooms. After the tempeh has marinated for a bit, put the tempeh and the marinade in a frying pan and cook the tempeh on medium heat, just long enough to warm the tempeh and cook the marinade into the tempeh. Now it is time to toast the bread. I use pumpernickel bread, but you could use whatever kind you like. I also use real butter, but if you choose to veganize this, you can use your choice of vegetable spread. I melt a little butter in the pan and toast the bread. I think this makes the bread have a better taste and the bread isn’t too soggy from butter. Place the tempeh on one slice of the toasted bread and cover the tempeh with Swiss cheese (or your soy alternative). This won’t make the cheese all melt-y like you want it, so I pop the sandwich in the oven for a bit to melt the cheese. I suppose you could also microwave it, but I don’t have a microwave and I don’t plan on buying one anytime soon. However, if Mark gets his way we will have one. When the cheese is nice and melted, place some sliced tomatoes and spicy coleslaw on top. What is spicy coleslaw, you say? I served these delights up with a side order of steak fries and an organic dill pickle, both from Hannaford’s supermarket. I highly recommend their pickles. Unfortunately, I didn’t use them to make the Kool-Aid pickles, which should be ready for review on Saturday. Hurrah for tempeh Reubens! I hope you all have a great day and keep cooking!